This card probably seems familiar if you have been here before. I was talking to my sister today, and she said that the snowflakes in the Retro Flakes set reminded her of dandelions, she also wanted me to make a card with a "fairy dust" theme (sparkly and purples). So I did a little bit of both of her suggestions. 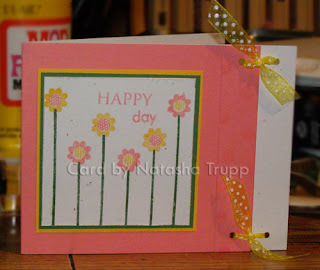 I stamped the "flowers" with yellow craft ink, then overstamped with the glue pad, and sprinkled the yellow glitter on. 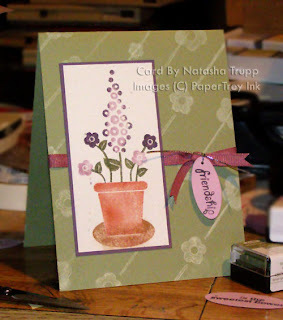 The stems were taken from the Green Thumb set, and embossed with pearl glitter embossing powder. 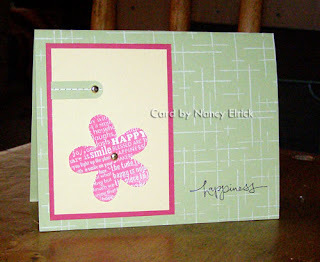 The word happy was taken from the mini fancy flakes set, I also embossed that. I was in the mood for something a little different, so I went with a long card format. This one is 3.5x8.5. Here's my first creation (turns out my batteries only took 6 hours to recharge, I had forgotten that I got up so early today). I did the versamark resist, then rolled the blue frost spectrum pad overtop, after giving it ample time to dry. If you brayer too soon, you smear the images. Once I saw this set, I knew I wanted to make some shrink charms with it. I used the largest image, which is about 3x3, stamped it with my ultramarine stazon onto white shrink plastic, then cut it out and very carefully heated it. Because I was pretty detailed with the cutting, I had to be extra careful. In the past, sometimes the plastic bends too fast and melts to itself, not fun. But all was well this time! To finish it off, I tied it onto the cardbase with some silver cord over the white organdy. 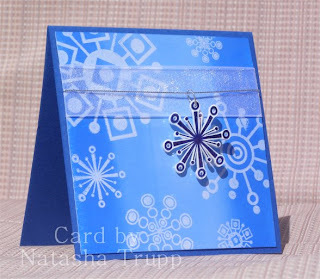 Voila, winter wonderland on a card! Here's another completed project. 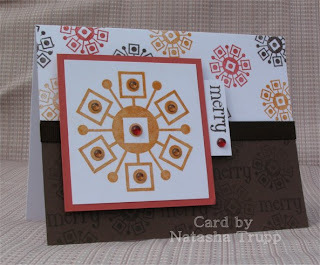 My inspiration for this one came from the gelly gems, in the Dazzle Me pack, there are red, orange, clear, and silver. I've also used this colour combination with success in the past. Once again, I used the retro flakes. These are such fun! They could even work well for non-holiday themes. The greeting on here comes from the Merry & Bright set. First off, I received this amazing RAK from Lauri of I lie, cheat, and CASE. It's absolutely beautiful! These colours are so cheerful and springy! Next up, I know fellow bloggers seem to love the vicarious "good mail days", so I thought I'd share some of that here. I got a nice boxful of goodies from gelatins. 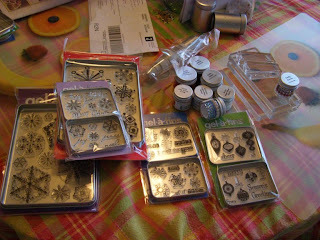 They are not all pictured here, these are just the holiday items, some embellishments, and stamping accessories. The sets here are Retro Flakes, (large and mini with sayings), Fancy Flakes (large and mini with sayings), and Holiday Cheer. I also received Sewing Kit and You Spin Me Round. So I shall be having lots of fun today. My camera batteries are on recharge for the day (seriously, takes like 8 hours...), so I don't know if I'll have any creative updates until tomorrow. When the Green Thumb set was first released, I loved Amy's card with the hanging muddy boots. So, I started with that general idea. I had stamped this turquoise ribbon the other evening with some chocolate dots, so that dictated my colour scheme. Also, I've been incredibly inspired by Heather's use of craft ink and Kraft paper, so I also went with that idea. I stamped the boots first with turquoise craft, then muddied up the bottoms with the chocolate craft ink. One of the nice things about craft ink is how easily they blend on the stamp. I cut them out, tied them together with some silver cord, then mounted them on my wordy background. The bottom panel is stamped with various circles I found. 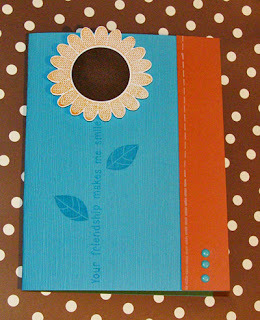 Two are from Green Thumb, the outline circle is from the Chocolate Bliss set by gelatins. Well, certainly enough of you tagged me...So here are seven random facts about me! 1) I am constantly writing my name. When I run out of ideas for doodles, I do my signature over and over again. 2) I've always had at least one cat in my life, since birth! There was Deena (who passed on in 1995), and still alive and well, are: Gizmo(16), Sammi (11), Nigel (technically not mine, but lived at my house for a while, no clue where he's at, as he was my brother's roommate's cat), and Jessie (6, currently in Victoria, but will be returning in May). 3) I like to sing, but my voice is too low to sing along with most popular female singers. So I end up singing along with male singers. 4) I'm a hobby demo, but I love designing classes and workshops that never take place. 5) When I was little (think 3-5 years old), I came up with strange explanations for things. Like I thought the moon was actually the earth's reflection, and that there was this giant mirror set up over Russia that reflected the Earth. The reflection was shades of white, because in my mind Russia was a bleak place that had a no colour. 6) I'm not an angry person. I avoid conflict, but when I have to help a customer with the photocopier, I am filled with rage, but I carry on with oozing sweetness and a smile. 7) I'm short, not quite reaching 5 foot 2. My license says that I'm 5 foot 3 though. Speaking of licenses, I need to renew that soon, AND I need a new picture, boo-urns. Here's a card featuring one of the patterns from the palette'o'prints. I love how the 4 colours it comes in coordinates so nicely with the Sweet Shop ribbon. I had to use them together here. The dog is coloured in with pastels and blender pens in chocolate chip and apricot appeal. The greeting is a Hero Arts greeting. And thank you all for tagging me. I haven't got around to deciding what 7 random tidbits I'd like to share. So I'm working on it, NO more tags, please! 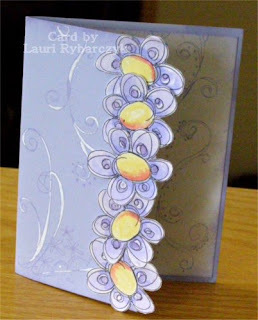 I've recently become quite obsessed with attempting to find the fun doodlebug embellishments. Their website says they are now available worldwide. Well, I've only found a few items so far in Winnipeg. I really like the look of their buttons, particularly the polka dot ones and the sparkly ones. So, what do I do when I can't find the stuff I want? I try to recreate it myself. I finally got one of the singo uniball white gel pens. That thing is amazing. I vaguely recall seeing someone use it for this purpose in the past. I decided to take a stab at it. You can actually feel the dots on the button. While I had that out, I doodled other items on some buttons, wavy lines, stripes, that sort of thing. I just have to figure out how to make the sparkly buttons now. I have a few thoughts in mind, mainly gluepad + glitter+ fixative or mod podge+glitter. We'll see how that works out. For now, here's the card. After a day of "serious" stamping, so to speak (it's all fun, but still...) I decided to break out the silly. You know how sometimes you just want to colour something in? That's where this all started... I felt like watercolouring, but didn't, if you know what I mean. So I used stampin' pastels and blender pens. I love this little dog, he's so cute! I decided to use silver as my accent colour, so I broke out the precious brushed silver, and also silver cord, and eyelets. I also decided to try something new. I was out shopping this morning, and saw some amazing suede paper. Not a fan of the price tag though (2.00 for an 8.5x11). Then, I remembered, hey, what about faux suede. From what I've seen in the past, it looks pretty genuine. I got out my vanilla craft ink and sponged and smeared on the red paper. I also added back in some red ink since there were some spots that I dabbed a bit too much of the vanilla ink on. I really like how it turned out. It does trick the eye and fool you into wanting to feel it. So here's where the silly part begins. I wanted a small greeting. I thought about using something from the Paper Tray set, but wanted something fluffy. So I joked to my sister that I should use "what up dawg? ", I also suggested "throw me a frickin' bone here", but that really didn't go with the occasion I intend to use it for. So, it's almost 20 degrees Celsius outside, and what am I doing?? Making holiday cards! There's a big call this Monday, so I am hard at work creating all sorts of fun holiday goodies. I've made 3 items so far. Here's a glimpse into my "studio" on this fine Saturday afternoon. All stamped images are by gel-a-tins. 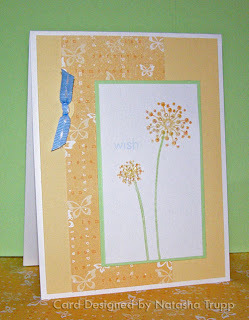 Paper and ink are by Stampin' Up (I used Ballet and Bashful Blue). Other items, let's see, buttons, silver cord, white grosgrain, and some stickles. I'm not sure how I managed to get the silver bow just so, pure fluke I guess, as this is something I generally struggle quite a bit with. The white grosgrain is stamped with craft ink. I had done the polka-dot ribbon before, but used dye ink markers. These of course, bled. It looked cool, but sometimes you want just nice perfect dots, you know. So finally, lightbulb moment, use craft ink. The stuff is good for stamping on fabric. I actually use the top of my j or i from the golly alphabet to stamp the ribbon. So there you have it, more ways to "save". Don't go and by that polka dot ribbon, make your own. And now that I have those 100 yard roll of white, black, and brown grosgrain, you can bet I'll be doing this a lot. 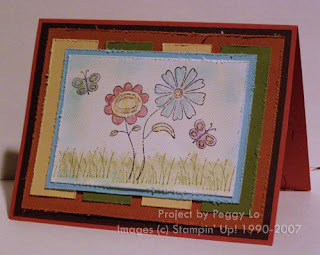 I have yet to try this with other images, but I will be trying it with my technique tuesday stitches stamps. Here's a card I made tonight. I've got this Tinkering Ink paper, and thought it would look neat to pierce around the flowers. I did one, it looked neat, but kind of out of place. So I did another, and another. Then it still didn't feel quite right, so finally I just outlined everything with piercing. I found some coordinating ribbon, and made the card into a monogram so as not to hide all the work. Just a note, the colours are off, there's no daylight, and I didn't feel like messing with the white balance, and all that other fun stuff. If you want to check out the true colours of this very vibrant paper, check it out here: http://www.tinkeringink.com/. And in other fun, I received a rak/thank you note from Tracy! It's so pretty! Love how she used the designer paper as the main image, and those little rhinestones are so precious! There was a challenge on SCS quite a long time ago. It was to use fabric on your card. Well, I brought this awesome fabric to the craft room, and there it stayed... Until today! I finally did something with it. The fabric has such a cool texture and pattern, that I didn't want to take away from it. 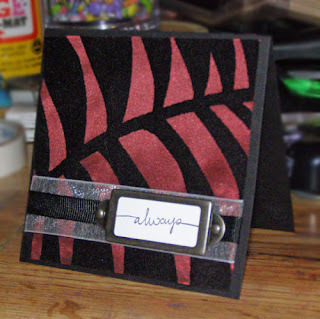 I slapped on some ribbon, a small greeting in some hardware, and voila, a card! Other information: I've received a few comments and emails about adding a feedblitz "subscribe" option. I've used the service, I'm not terribly fond of the service, but that doesn't mean you can't use it. If you want to become a subscriber, simply sign in to your feedblitz account and paste in the link to my blog and confirm the subscription. That's it! I believe this will work with any blogs that have feeds. Hope that helps! 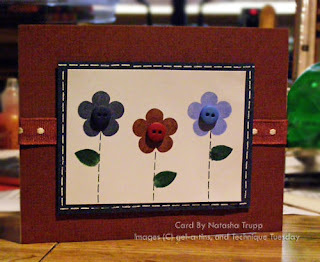 Here's a nice spring-y card. I used my new Green Thumb set. I stamped the flower tops with barely banana, then rocked apricot around the edges. I used craft inks, as they blend nicely. Then I stickled all the little dots, let it dry all day (plus I had to go to work, so that put a stopper in the crafty plans...), then I came home and completed the card. I had all day to mull over the layout, and this is what I decided. 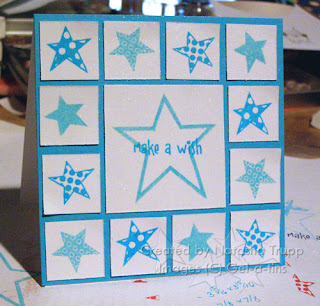 The word wish was taken from Paper Trey, the word in the set is wishes, so I just didn't ink up the -es. 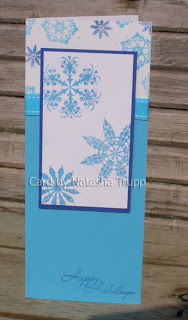 The patterned paper and the ribbon are from Stampin' Up! I also got my order of ribbon today! Woot! Isn't it awesome to receive 300+ yards of ribbon for less than it would cost you through other sources... Love it! Here's a quick card I made last night. 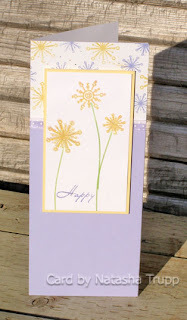 I love the look of the long-stemmed little flowers with a small sentiment, so I started with that. I chose colours that I often ignore: cameo coral, summer sun, and garden green. The main images were done in craft inks on confetti white. Then I scored at about 1-inch from the right on the coral base, folded it back, and tied some fabulous polka dot ribbon through it. There are some dots stamped on the folded part, but they are hardly visible. I also distressed around the confetti piece with an x-acto knife. 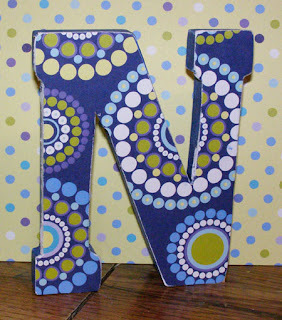 I had seen these letters at Michaels the past few times I was there, but I had resisted (plus they didn't have an N in the size I wanted). Finally, I got one. Then it sat for a week. I didn't know quite what I wanted to do with it. Yesterday I pulled out some blue paint, gave it coat, then used this awesome paper by Pink Martini (called go-go boots!) and covered it. I don't know if I will add anything else to it. I don't know if I like the look of the ribbons all over, so for now I shall leave it. 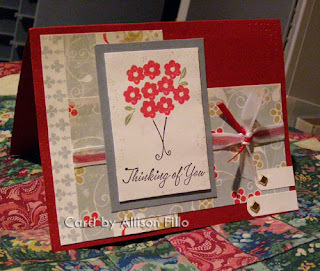 I love receiving fabulous cards from other stampers! This one is from Nancy. I love the fun spring colours she used! What a delightful surprise! Thank you Nancy! Who knew I had a Green Thumb! Here's my first card playing around with it. I pulled out some colours I never use. I got the craft ink spots, since I've been using the acrylic stamps so much lately, and I felt like I needed these in certain situations. I especially like the soft subtles craft ink. They are still soft, but they are that much bolder, if that makes sense. You can really see the colours. So here I used pale plum, perfect plum, mellow moss, also really rust for the pot, and creamy caramel for the shadow. I made the background using various sized flowers and stems with very vanilla. Other notes: the shadow was made using an oval punched piece of spare rubber, then mounted on EZMount. The main image is stamped on confetti white (explaining the little flecks of colours you may see). 10PM update: Well, I just wasn't quite done for the evening. Here's a fun little thank you note. I dry embossed a group of 4 squares. Stamped, cut out, and popped up the strawberries, tied on some fabulous ribbon, stamped the greeting, and this card was the result. I really like it!This project has been accepted, woot. Brother's Birthday, Shipment Arrival, and Sketch Challenges. 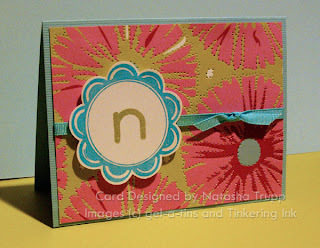 So, I had some spare time this morning, and whipped together this fun, bright card for this week's sketch challenge. It really just came together, it's always nice when that happens! I used the carpet texture plate on the orange. 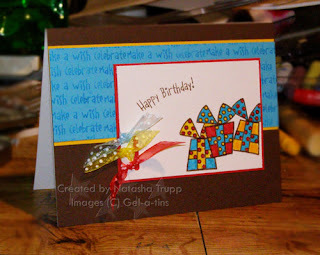 The colour combination was inspired by the Party Pieces Simply Scrappin' kit. This one goes out to my brother, Jeremy. It's his 29th birthday today!!! I know he comes here once in a while, so I figured I'd post it for him to see. I was very disappointed to come home to no crafty packages. I have several things coming from several places, so I was a little sad. My UPS shipment was held up at customs. Boo! I had forgotten about the fact that customs would've been closed Friday and Monday, so there was probably a backlog today. Here's hoping it finally arrives tomorrow. In the mean time, I picked up a few other items. I got a few of the Fiskars texture plates. They are pretty neat. I was a tad annoyed, the packaging says it contains these 2- bubbles/dots, but instead it contained snowflakes/raindrops. However, the snowflakes are pretty neat. I'd never used this tool before, so it took a few tries for me to get it right. I found that I needed to actually tape down the piece of paper. I used masking tape, after de-stickifying it a bit more. I figured with the downward pressure from the embossing, the masking tape would stick too much. In case you're wondering how, just touch the sticky side against your hands. The natural oils in your skin do a good job at taking away some of the sticky. I also finally figured out the right motion, it says circular motion, I found that very small, hard motions worked best. The other item I picked up today.... was the cropodile. This is one of those items that I had heard tons of crafters rave about, but I didn't really know. I had never tried it. Oh my goodness. It's amazing. Just the silent eyelet setting alone is worth the money. 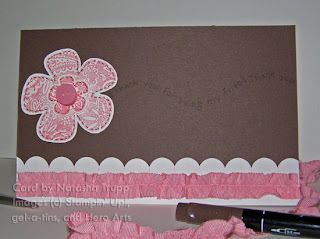 I had these large flower eyelets from Stampin' Up! and I could not get them to set nicely without severely warping the front and/or back. Well, now I can finally use these! I love it!! It's so nice not to have to hammer, that always left my hands kind of tingly. I can see why eyelets made a bit of a come-back. They are as easy to use as brads, with the right tool! Here's my card. 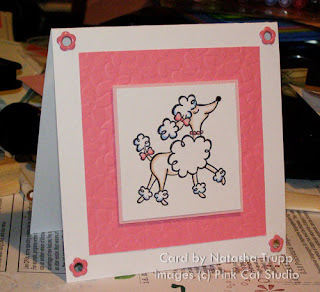 I used a Pink Cat Studio stamp, the blossoms texture plate, and my retired SU! eyelets. Once Christmas is over, I tend to stay away from these particular colours in the Rich Regals colours family. 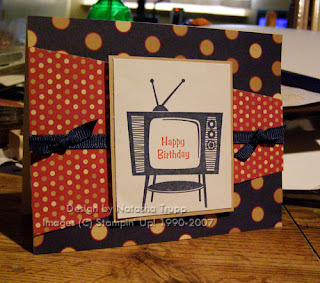 However, I was feeling inspired by this card, and the only coordinating buttons I've got are the Rich Regals ones. So those became my colours of choice. I also don't have the Big Blooms set (I am resisting it, I've got enough flowers! ), but I do have these cute flowers from gelatins "Bloom". I wasn't sure about what to use for my stems and leaves, so I checked out a few sets on my table, and found that the stitches from Technique Tuesday went well with the whole button theme, and a petal from one the flowers from gelatins "Sparkle & Shine". I was going to faux stitch the navy mat, but that seemed silly, when I had that stitch stamp right there. 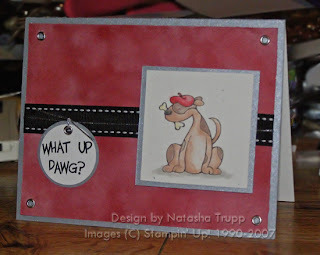 I embossed it with white embossing powder for more texture. Here's a cute little card I just finished. It measures 3-15/16 x3-15/16. The littlest squares are each 7/8x7/8. The central square is 2-7/8x2-7/8. If you are making this type of card, I highly recommend using a somewhat removable adhesive. Otherwise, if you don't get the spacing just so on the outer squares, it could get frustrating. Luckily I have some removable adhesive, until it's pressed down. I got it at a local dollar store. Since I was going with the whole glitzy theme, I misted the card, once finished, with some pearlex and alchohol mixture. It sure is sparkly :D. The stamps are by gelatins. Seriously, I know too many people with birthdays this month. Here's one for my uncle. I decided to do this week's sketch challenge, since it's been a while since I last did one. I really like the Stay Tuned set, but have maybe used it 4 times. So this morning, I was determined to put it to use. I also didn't feel like doing a lot of background stamping, so patterned paper it was! This assortment is from the 3rd Costco paper pack I believe. I had the card all done, but it wasn't feeling done. So I added the navy ribbon, but then the balance was off. So, I added little knots onto the ribbon with glue dots. Then, it seemed to work again. chocolate eggs and other yummies! I was looking through some inspirational galleries to get some ideas for layouts. I keep resorting back to the same old layouts, so I wanted to try something different. I found this card by Michelle Wooderson. It used the small slot punch in a way I had been meaning to try. And with all that new polka dot ribbon, I decided to give it a whirl. 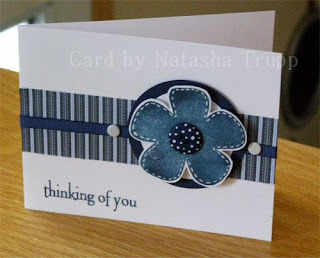 I chose the three colours of ribbon that I wanted to tie through the side slot, then designed the card to match accordingly. 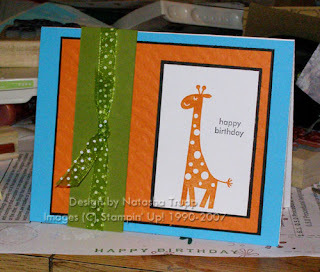 All stamps are from the happy birthday set from gel-a-tins . Papers & inks are Stampin' Up. I don't know who makes the ribbon, since I received it in share. I'm not 100% happy with the card, I know what I don't like about it, but sometimes, it's okay enough to work. I have this problem where I cannot throw stuff out and start over. I feel if I've invested the time in it already, I don't want to throw that out. I know that's not always the best way to be, since then you may be missing out on something greater. But really, on a Thursday evening, after a day that was too long, I think it's okay. I was about to publish without uploading my photo. Seriously, I cannot be the only one to almost always do this! Yay! I received my first batch of sheer polka dotted organza ribbon. It is beautiful!! So basically, I picked 1 of the 8 colours, and made my card to go with it. I chose the light pink one, so I went with the gelatin "Pet Shop" pig. 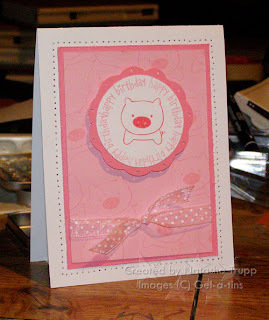 The happy birthday frame was stamped with a bended clear stamp greeting. I lucked out in that it exactly fit 4 times around the pig. 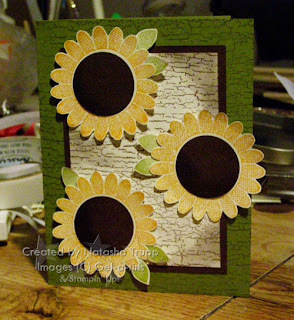 I really liked how my sunflower turned out the other day, so I decided to try another card featuring those. I added some leaves this time as well. Both the flowers and leaves are from gelatins Sparkle & Shine. I kissed them against Linen, so they'd have that fun texture. Then cut them out, punched and stamped chocolate circles, did a little sponging on the side, then stamped my card and panel with Weathered, and that was it! 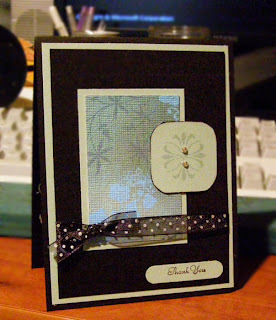 A relatively quick card, other than the cutting out (which I did last night). The rest of the card I managed to finish up before heading off to work. It's been like a mini-VSN for me these past two mornings. I've started a card image the night before, then in the 25 spare minutes I've got in the morning, it's this crazy mad dash pulling a card together. I don't have quite enough time to get in photographed and uploaded in the morning, but it's nice to have something ready to post once I'm home. It's also really nice to be creative before going to work. Paisley Kisses and my first Blogger's RAK! One of my gelatins sets (Bloom) has this big, gorgeous, solid flower. It's just begging to be stamped against a background stamp. I decided to try it against Paisley. I love how it turned out. I added some chocolate chip faux stitching, just because I felt like the flowers needed some outlining. I added a button to complete the whole fashion theme. The greeting is a Hero Arts message (thank you for being my friend), that I curved to make for a fun stamped sentiment. This is also one of the many nice things about clear stamps. They are flexible. You want a curved sentiment, you've got it. Allison (queen of all things blog candy) had a good tip about doing this. If your sentiment isn't staying exactly where you want it, adhere it to the block with some double-sided tape until you are done. I didn't need to do that with this, but perhaps if I was making a circle with the, I would need to. Now for my first blog rak! It's from Peggy Lo (aka smallpigpig). 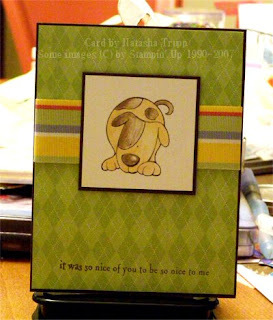 The lady amazes me, she does so much, and still has time to share her awesome projects with us, and organize swaps! Check out her blog, she's got a great writing style too The Life of a smallpigpig. Here's the card she sent me! Isn't it fabulous! How many stamping companies can I use?? In other news, Sarah (here) still has her contest going on. The guessing game is over, but there's still a random draw for an exciting goodie bag!